Fosfomycin has emerged as a potential therapy for multidrug-resistant bacterial infections. In most European countries, the oral formulation is only approved as a 3 g single dose for treatment of uncomplicated cystitis. However, for the treatment of complicated systemic infections, this dose regimen is unlikely to reach efficacious serum and tissue concentrations. This study aims to investigate different fosfomycin-dosing regimens to evaluate its rationale for treatment of systemic infections. Serum concentration-time profiles of fosfomycin were simulated using a population pharmacokinetic model based on published pharmacokinetic parameter values, their uncertainty, inter-individual variability and covariates. 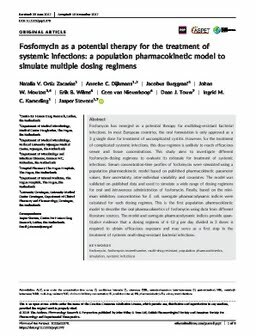 The model was validated on published data and used to simulate a wide range of dosing regimens for oral and intravenous administration of fosfomycin. Finally, based on the minimum inhibitory concentration for E. coli, surrogate pharmacodynamic indices were calculated for each dosing regimen. This is the first population pharmacokinetic model to describe the oral pharmacokinetics of fosfomycin using data from different literature sources. The model and surrogate pharmacodynamic indices provide quantitative evidence that a dosing regimen of 6–12 g per day divided in 3 doses is required to obtain efficacious exposure and may serve as a first step in the treatment of systemic multi-drug-resistant bacterial infections.